Summertime, and the livin’ is easy. 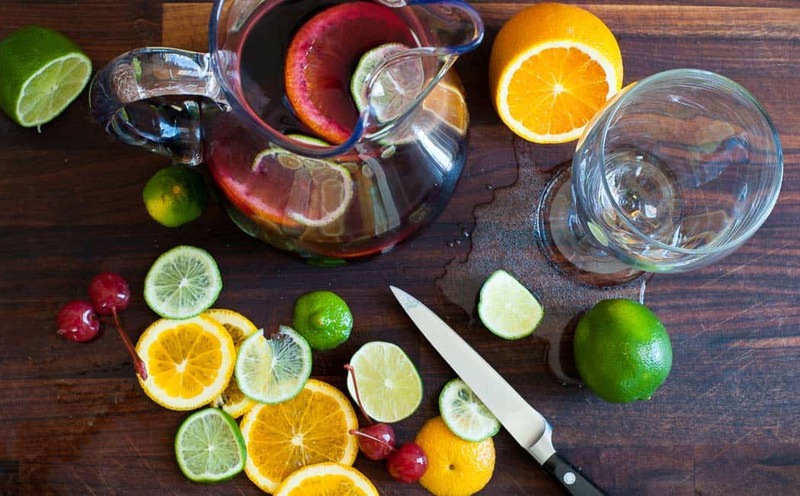 Time to mix up a refreshing simple summer sangria spritzer. Perfect for outdoor parties or anytime you want a cold, relaxing refreshment. Sangria is just about any any fruit you can think of, mixed with some wine of your choice and in this case, lightened up with some flavored sparkling water to make a spitzer. I used a Spanish Rioja tempranillo to keep this sangria somewhat traditional, similar to the sangria made tableside at Tampa’s Columbia restaurant. The Columbia adds a splash of brandy to their pitchers, and you could add a couple ounces if desired. 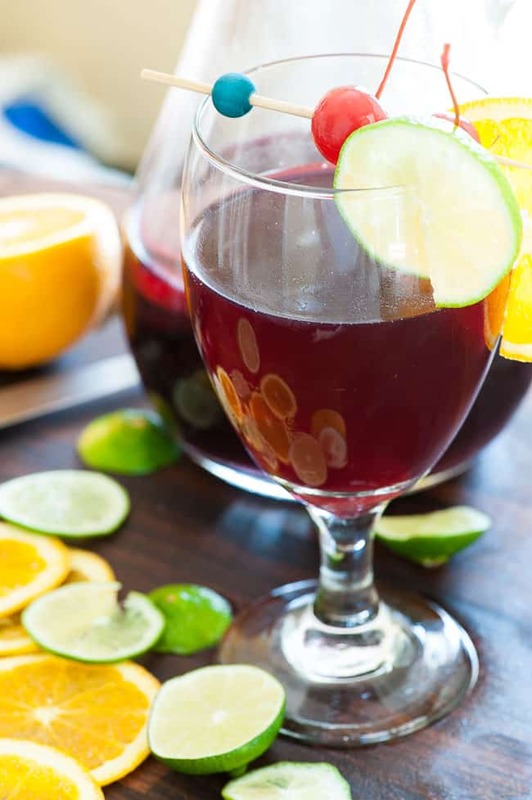 Sangria can be “tinto or “blanco”, red or white as desired. If you make it with a sparkling wine, you would have a Sangria de Cava and you could fortify this with a little Grand Marnier, Cointreau, or triple sec. Oranges and limes were my fruit of choice, sliced and placed in the pitcher along with their juice and the tempranillo. To give it a little more sweetness, I mixed up some simple syrup and added 2 tablespoons to the pitcher, use more if you like sweeter drinks. Put the pitcher in the refrigerator for at least four hours for the flavors to meld. 24 hours would be even better. Target brand ‘Simply Balanced’ citrus sparkling water is what I used for the effervescence. San Pellegrino sparkling blood orange would be a good choice too. Fill your glass up about three quarters of the way and then top off with the sparkling water. Make sure that the ingredients are well chilled or add a couple of ice cubes. This makes a delightfully fresh drink. Garnish with additional slices of fruit and maybe a few sweetened cherries. 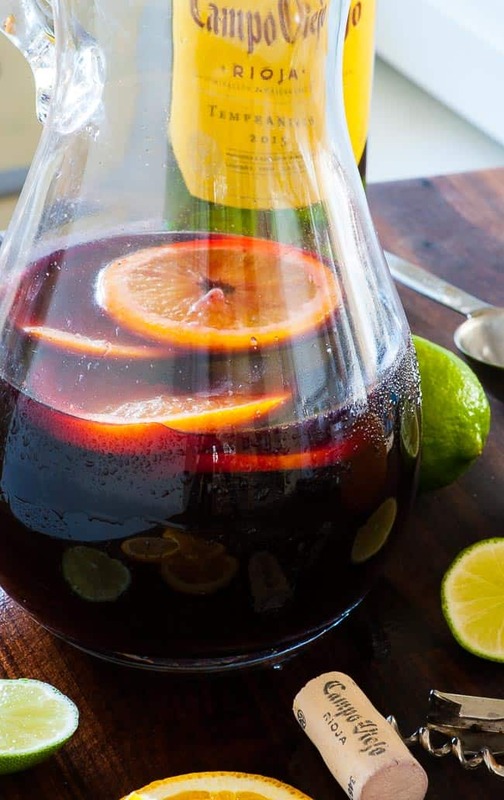 Invite a few friends over to share your summer sangria spritzer and put something on the grill for a memorable summer outing. 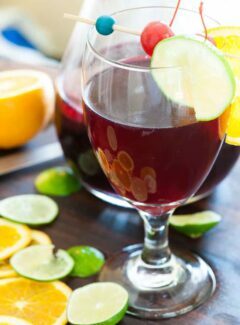 Place the finely sliced orange and lime in a pitcher and add the fruit juices, cooled simple syrup and wine then place in the refrigerator for 4 to 24 hrs. Serve in chilled glasses if possible, fill 3/4 with wine and top off with sparkling water. Garnish with additional orange and lime slices and cherries. The Grand Marnier would be good in this, plus the brandy! This is a perfect recipe for the next wine cooler/wine spritzer pitcher I plan to prepare. Hi Alan. It’s really tasty and don’t be afraid to add a little brandy or Grand Marnier. This was so refreshing and light, and great with appetizers!